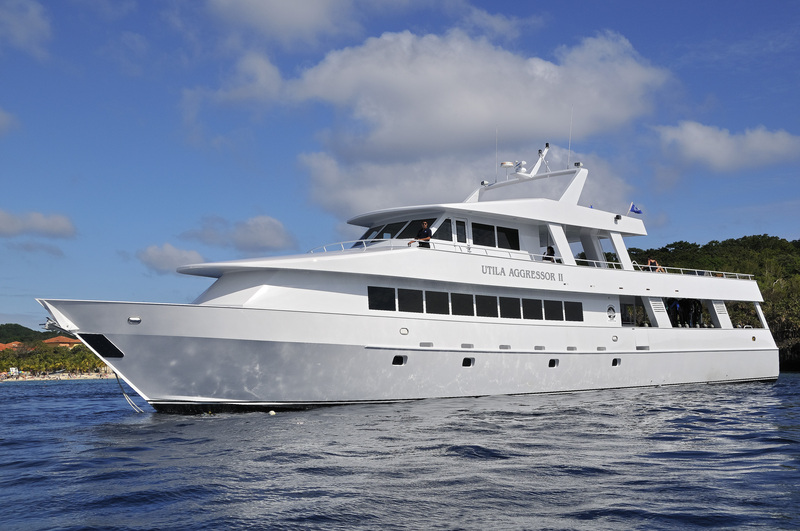 The liveaboard dive boat Utila Aggressor II welcomes you aboard for a week long scuba diving vacation off Utila, the third largest of the Honduran Bay Islands. Utila lies at the southern end of the world’s second largest barrier reef system, the Mesoamerican reef. After flying into San Pedro or Roatan, you will take a scenic 30-minute charter flight to Utila where you will board the Utila Aggressor II liveaboard boat. During this dive boat’s Saturday-to-Saturday itinerary you will enjoy scuba diving, snorkeling, swimming and beach combing. Diving begins on Sunday morning after the Captain has provided the dive briefing, and lasts through Friday morning. On Friday afternoon when the boat returns to port you will be able to stroll through the town of Utila, venture outside the town for additional island exploration, or relax and enjoy local charm at Bando Beach. Utila boasts an outstanding climate. Visitors to Utila enjoy this lush, tropical paradise year round. Even during its rainy season between October and January, there are still plenty of sun-filled days. Humidity levels are at their highest from May through September. During the summer months the average temperature is in the upper 80s (30-32°C) and during the winter months temperatures average in the low 80s (27-28°C). Water temperatures range between 78°F and 82°F (25.5°-27.7°C) all year long. Even though water temperatures are pleasant during the summer months, because you may make as many as five dives each day, including night dives, we recommend a 1-3mm wetsuit or shorty for protection year round. All scuba divers must show their c-card or proof of certification to the divemaster prior to making their first dive. Each week, the dive sites are selected by the boat’s captain, and may vary according to weather conditions and location. Some of the dive sites the Utila Aggressor II will take you to may include Coco’s Sea Mounts, Black Hills, Duppy Waters, Taviana’s Wall, CJ’s Drop-off, Mary’s Place, and Wreck of the Aguila. Other famous sites on your itinerary may include Cannery Bank, Halliburton Wreck, Hawksbill Bank, Raggedy Cay, Jack Neil Point, and Old Bank. Utila’s diverse marine life includes over 50 species of coral, 220 species of reef fish, Dolphins, Whale Sharks, Moray Eels, Turtles, Eagle Rays, Seahorses, and much more. With its variety of underwater terrains, dive vacations include sheer wall dives, sandy-bottomed shallow reefs, sloping fringing reef, and deep wrecks. Your week may start with diving near Blackish Point and Old House. At 65 feet deep (20m) intermediate divers will enjoy drift diving at Blackish Point with its caves and crevices. Creatures such as Spotted Drum and Porcupine Fish, as well as large Rope and Tube Sponges can be spotted here. Reef diving at Old House is good for divers of all levels of experience. Average dive depths are 49 feet (15m) and visibility is good at 33-100 feet (10-30m). Here you will see Coral Whips, Vase Sponges, and Brain Coral heads. Mary’s Place is considered one of the most famous dive sites off the south side of Roatan. This lush reef provides numerous photo opportunities with its crevasses and tunnels that run through it. Here you will find abundant fish life and beautiful coral overhangs, Creole Wrasse, Seahorses, Glassfish, and Chubs. Dive depths start at 20 feet (6m) but typically go much deeper. Black Hills, located 1.5 miles (2.4 km) off Utila, is a must-see dive site. With a light current, Black Hills is a seamount that ascends to 35 feet (10.6m). Here you will see schools of Atlantic Spadefish, Horse-eye Jack, Scorpionfish, Toadfish, Southern Sennets, and the rare Frog Fish. The Barracuda and a resident Turtle are not frightened by divers. Pelagics such as Marlin, Manta Rays, and Sharks, including Whale Sharks, can be spotted here. Deep dive enthusiasts will love CJ’s Drop-off with its dramatic views down into the deep blue water and where Golden Tail Moray, Spiny Caribbean Lobster, and schools of Jack are plentiful. CJ’s offers one of the largest drop offs in the Caribbean, with its reef wall dropping straight down from 15 feet (4.5m) to more than 3,000 feet (914m). The Aguila, or Eagle, Wreck was a 210 foot (64m) cargo boat that was carrying concrete when it was run aground near Utila, where it remained for several years. It was finally sunk in 1997, with the intention of making it into a premier dive site, settling upright and perfectly intact in 100 feet (30m) of water. In 1998 Hurricane Mitch battered the north shore of Roatan, and broke the Aquila into three pieces, creating numerous nooks and crannies for scuba divers to investigate. It now rests on a deep sand basin with two coral outcroppings. The depth of this site ranges from 22 to 108 feet (6.7-33m). All around this wreck, the fish are both friendly and curious. Two huge Green Moray Eels call the wreck home, and can often be seen swimming through the boat’s midsection. Divers will also see Dog Snappers, Blue Parrotfish, and Black Groupers in the area of the wreck, and possibly even King Crabs living in the portholes. While this is an open-water advanced dive, only expert divers should dive this wreck at night. Other dive sites include popular Raggedy Cay, which begins at 30 feet (9m) and drops off to 140 feet (43m). Here you will see Octopus and Spotted Morays around the sand channels that lie along the coral garden. You will also see Majestic Eagle Rays pass by and Hawksbill Turtles munching on the soft corals in this area. Elkhorn Coral, Fringed Filefish, and Caribbean Reef Squid populate shallow dive sites such as Old Bank. One of the area’s best night dives is Jack Neil Point, where divers will enjoy seeing the Long Snout Seahorse, Flying Gurnards, Large-Eye Toadfish, and Octopus. All dives are made from the swim platform of the mothership. The expert crew assists passengers with their every need. In addition to unmatched scuba diving, guests aboard the Utila Aggressor II always enjoy excellent accommodations and delicious meals as part of their vacation package. The Aggressor Fleet strives to provide scuba divers and vacationers with the highest quality and most innovative liveaboard experience possible. Their dive boats afford guests both safety and comfort as they travel to the best diving locations around the world.